After having cheesecake for breakfast yesterday, I decided I needed to have a healthy salad today and it just so happens that some of my winter veggies are ready to do just that. 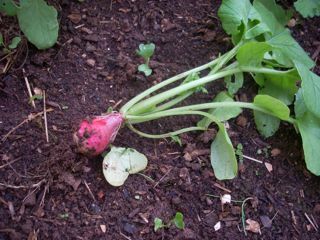 I found a huge radish and cut some of the lettuces and found a green pepper and some tommy toes. There is enough to mix some together for a nice side salad to go with my leftover Jalisco’s tacos from Wednesday night out with Herb. WordPress seems to think that Herb is a link. HA! 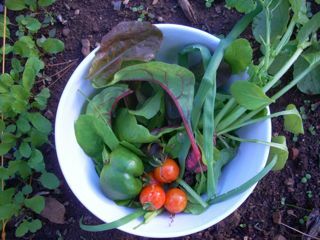 If you look close, there is some baby arugula, some red romaine lettuce, some spinach and some chard. My carrots aren’t even close yet but the tops are big enough now to be able to tell they are carrots and not a weed. The broccoli is still in the seedling stage as is the cabbage and radicchio. I probably won’t see those until Spring. Something to look forward to. I need to see if I have something good to mix together for a dressing. There is fresh basil still out there so maybe a basil dressing would be good. Susie Morgan Wilburn • This entry was posted in ...in the Garden, cold frames, vegetables and tagged Bell pepper, Carrot, Cooking, Home, Jalisco, Lettuce, Romaine lettuce, Salad. Bookmark the permalink. Herb is the missing link!